Springing out of the black and white world of The Specials, Fun Boy Three arrived in the early 80’s alongside shiny 2.0 versions of Scritti Politti, The Associates and The Human League. These groups former years were experimental and dour, but their later careers showed a shared ambition of breaking into pop charts while retaining an experimental and subversive edge. Being on the UK’s Top of the Pops was suddenly more important to the underground than ever, whether it was under personal or political motivation, and it would be a battlefield. 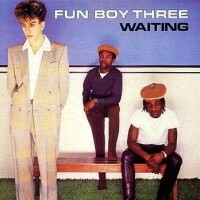 With Fun Boy Three’s “Waiting,” their second-wave Ska roots take a backseat to showcase the studio mastery of David Byrne who at that time was on top of the world after “Remain In Light”-era Talking Heads and work with the B-52s. The Fun Boy Three are accompanied by horns and strings to give them a sophisticated sheen that never clashes with Byrne’s love and use of African instrumentation, and the Boys’s bring their political sloganeering and working class statements to the mix.